The Bible tends to be rather quiet on the subject of appearances. About the most we’re told about a Biblical figure, as far as I can remember, is that Elisha was bald. Oh, and Esau is covered in red hair. When other characters are illustrated, we usually know who they are based on their actions and surroundings. The old guy with the boat full of animals is Noah, the man parting the Red Sea is Moses, and the people standing around naked next to a fruit tree with a snake in it are Adam and Eve. Jesus is kind of an exception to this, though. We in the western world can pretty much always identify pictures of Jesus. He’s the handsome white guy with long hair and a beard who’s dressed in a robe. No one seems to take this literally, however, so we’re back to square one. 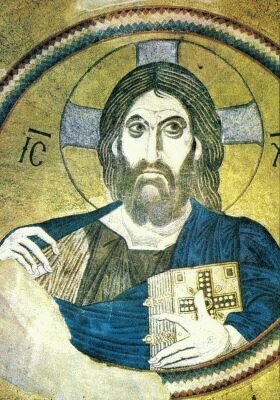 It’s likely that Jesus did have a beard, since that was typical for Jews of the time. But as for the long hair, Paul wrote in 1 Corinthians that it’s considered disgraceful for a man to have long hair, so would it have made sense for the founder of Christianity to have worn his hair that way? Actually, Paul never met Jesus, but just had a vision of him, so it’s possible he didn’t know what the guy looked like. James and Peter would have known, but Paul apparently didn’t get on too well with them. Still, I believe I’ve heard that long hair wasn’t common for that time and place. The lack of description in the Bible is exacerbated by the fact that pictures of Jesus were quite rare until the third century or so. Before that, he was usually represented by symbols. When people finally did start making visual depictions of the Son of God, they often had him look like a member of their own culture. Black Jesus wasn’t a fairly recent invention like Black Santa Claus, but is traditional in Ethiopian iconography. 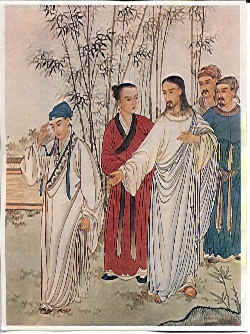 A nineteenth-century Chinese picture of Jesus shows him with distinctively Asian features. 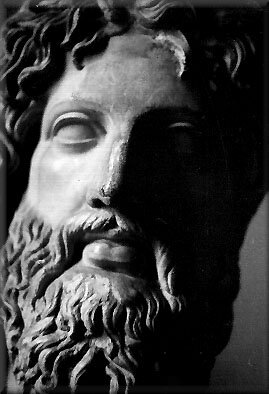 The now-recognizable representation of Jesus is Roman, and the long hair and beard are thought to be inspired by pictures of Charismatic philosophers and the chief god Jupiter, who were usually depicted with those features. Since it was the Church of Rome that became prominent in Europe, it’s not too surprising that the Roman depiction of the Christ would be what stuck. An interesting side note is that the attractiveness of Jesus was actually a matter of debate among early theologians. Justin and Tertullian thought that he was of unremarkable appearance, based on the lack of physical description in the Gospels combined with a reference in Isaiah 53:2 that Christians thought must apply to the Messiah. On the other hand, Jerome and Augustine of Hippo felt that God incarnate would have been perfect in form. And the Gnostics believed that he could change form at will. It seems that the attractive Jesus has won out in artistic portrayals. For more pictures of Jesus from throughout the centuries, try Wikimedia Commons and/or This Jesus Image Gallery. This entry was posted in Art, Christianity, History, Religion and tagged augustine of hippo, bible, elisha, esau, ethiopia, iconography, isaiah, james the just, jerome, jesus, jupiter, justin, paul of tarsus, revelation, rome, st. peter, tertullian. Bookmark the permalink. Jesus is Love it really doesn’t matter what he looks like. Just study his word and accept him into your life. So you’ve never taken a purely academic interest in anything? You seem to find the oddest commentators on these posts–the religious ones, I mean. And yet these same people only reply once and never read the rest of your blog. I would assume they find it through the tags, and just preach to everyone who so much as mentions Jesus in a post. I have to wonder what they think they’re accomplishing, though. Does anyone get a blog comment like that, and think, “You know, I’d never considered converting to Christianity before, but this just makes so much sense”? Yes, I’m a dude. Did you suspect otherwise?